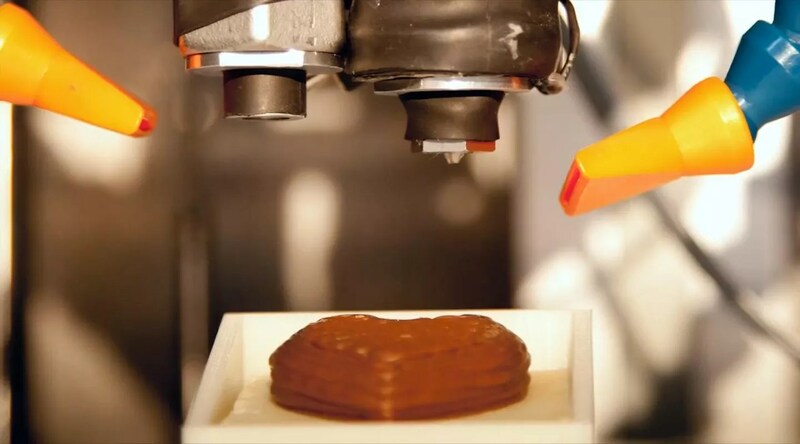 University of Exeter develops first 3D chocolate printer! Researchers at the University of Exeter in the UK must all have a sweet tooth as they?? ?ve developed a working prototype 3D food printer. Instead of polymer, metal or ceramics this printer uses chocolate as an ink. Yum! Video after the jump??? The research led by Dr. Liang Hao was conducted as part of the Research Councils UK (RCUK) Digital Economy Programme by the University of Exeter in collaboration with the Brunel University and software developer Delcam to look into practical applications of novel design & technologies. Already interest has been expressed to further develop and commercialise this technology. Clearly, chocolate as a printable material is just the beginning, its conceivable that multiple ingredients or food colour additives could be printed by one machine. Ingredients could be cooked or processed as part of the printing too ??? allowing Gordon Ramsey-esque chefs to focus more time on yelling and swearing. Most of all I?? ?m impressed the researchers are looking at the larger picture of what chocolate means to consumers ??? the idea that chocolate is a shared cultural activity. As such they have plans for an online shared community of 3D models. Sounds like a foodie?? ?s version of Thingiverse to me! I think the way we design, select and buy chocolate gifts is about to take a jump into the digital age?? ?